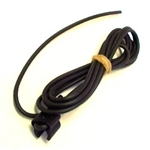 The Aim RPM clip wire is designed to be plugged directly on the spark plug wire and is used for RPM pick up from monocylinder, 2-4 stroke engines. Aim instruments can measure and record cylinder head temperature using a sensor (thermocouple) positioned under the spark plug. 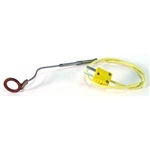 The thermocouple presents a turn in the lower part to make installation and disinstallation easier. All Aim thermocouples are K-type sensors.